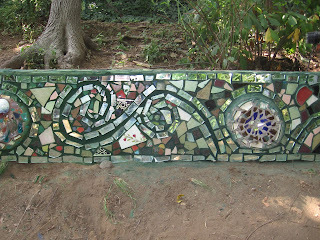 Lance, Lourdes, Sara and I worked a few weekends ago to mosaic the 2nd retaining wall in Lourdes' backyard in Yonkers. The lower wall was done Memorial Day Weekend 2006; it was much larger. This upper wall ran almost as long but was not as tall. The terrain presented quite the challenge though. Thought I'd share some pix. W e were lovin' that blue! This is beautiful! Is that all mirror? 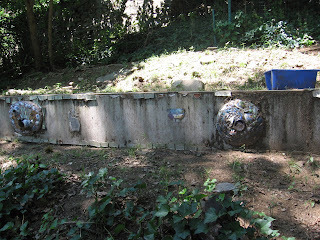 Is this done in the Isaiah Zagar style? Thanks for your comment! It is done in Isaiah's style. I did one of his workshops with a few friends and I'm addicted to it now. It's not all mirror; the rectangular mirror pieces are used to outline images and line the edges of the wall. 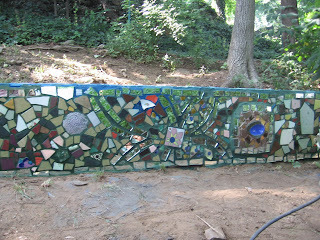 This was the 5th mosaic project that I have worked on. 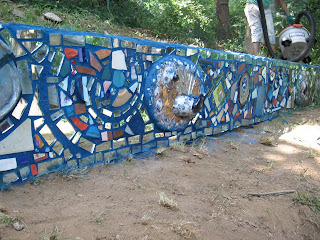 are you a mosaic fan?